For those who are not from Sydney, the symbolism of this cartoon is immense. This cartoon depicts the support pylon at one side of Sydney Harbour Bridge – a great Australian landmark known for its robust construction and design excellence. The road leading up the the bridge is laid with fibre-optic cable – the original solid, future-proof infrastructure that was to comprise most of the original NBN design before Malcolm Turnbull ordered it changed. But then the fibre stops and the bridge is spanned with the a ‘multi-technology mix’ that is grossly inadequate for the original purpose of the bridge – carrying cars and trains across it, symbolising the large bandwidth needs that a fibre-optic network is able to accommodate but the other technologies cannot. A bird on a leash – possibly a symbol for wireless, clearly incapable of transporting anything significant. 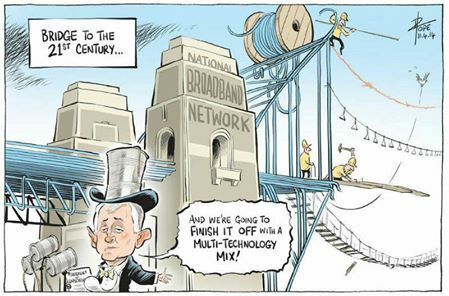 A tight-rope with a single man walking along it balancing carefully, holding onto a fibre-optic cable – possibly a symbol for the minority of people who will get Fibre-to-the-Premises under the Coalition’s MTM NBN plan. A Rickety rope bridge with falling planks – possibly a symbol for Fibre-to-the-Node over the decrepit, decaying Telstra copper network originally designed only for telephones. Communications Minister Malcolm Turnbull is depicted announcing his plan and speaking into three tin cans with strings instead of microphones, signifying his obliviousness to the importance of modern technology.